Melinda Bargreen’s “Classical Seattle” profiles the talented maestros, musicians and movers and shakers who have forged Seattle’s classical-music scene. Bargreen gives a preconcert lecture at 7 p.m. Friday, Nov. 13, at the University of Washington’s School of Music. 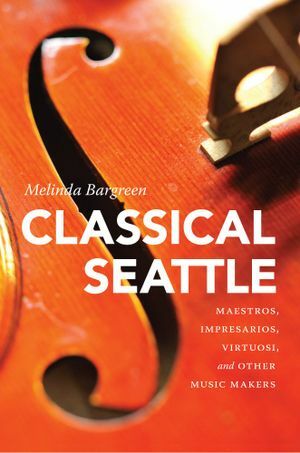 Melinda Bargreen’s “Classical Seattle” is a who’s who of the city’s classical-music scene over the past half-century, an entertaining recapitulation of interviews she did while serving as the music critic for The Seattle Times and writing for other publications. It’s also a window on pivotal events, most prominent among them the 1962 Seattle World’s Fair, which brought the city not only big-city muscle but also new expectations about the performing arts. Reading Bargreen’s book, you can draw a straight line from the staging of Verdi’s opera “Aida” at the fair to the construction of Benaroya Hall in the 1990s and the Marion Oliver McCaw Hall, which opened in 2003: All required the force of personality and a belief that Seattle was ready to reach for the stars. Bargreen revisits some of the material in her previous book, “50 Years of Seattle Opera,” as she describes how the Emerald City became a place that worshipped its own “three Bs”: Bach, Beethoven and Brunnhilde. Unquestionably, Seattle’s signature classical-music event has become the summer performances of Richard Wagner’s four-opera Ring cycle, in which the singer Brunnhilde plays a pivotal role. The main reason: Glynn Ross, the Seattle Opera’s founding general director and an impresario bar none. His successor, Speight Jenkins, changed some details while deepening the quality of the Ring experience, helping to ensure its place among Wagnerians worldwide. These are only two of the many Bargreen features in entertaining, up-close-and-personal vignettes. Equally capable showmen were symphony conductors Milton Katims and Gerard Schwarz, who became public figures of such regard that Katims’ face graced the city’s phone book in 1969 and Schwarz was named “First Citizen” 40 years later. Each had the push needed to create audience, performance space and funding at a high level. For both men, however, the Achilles’ heel in their long tenures turned out to be a troublesome relationship with the orchestra. Among the most interesting profiles are those of Seattle-based performers and composers, each with his or her own story about being trained by or performing with such legendary 20th-century figures as Myra Hess, Dinu Lipatti and George Gershwin. And most indicative of Seattle’s newfound sense of self, perhaps, is the chapter on “The Power Brokers and Patrons” — a selective sampling, to be sure, but prime examples of those with the drive and money to keep Seattle’s symphony and opera in the game through good times and bad. Still, as Bargreen notes, the lofty heights of big money and big talent are just the first key on the scale. More indicative of the music scene’s health are the network of educators, performers and community groups who created their own pockets of excellence at the University of Washington, St. James Cathedral and other spots throughout the Puget Sound area. Her stories fan out to embrace musicians who assumed leadership roles. In this mix, inevitably, are some groups who have succumbed to inadequate fundraising and internecine fights within their boards. “Classical Seattle” makes it clear that maintaining the delicate balance between prudence and imagination is not easy, especially as the economy seesaws and public funding diminishes. Ellen Emry Heltzel is a Portland book critic and classical-music fan.